When it comes to food, I’m a goat. I’ll eat pretty much anything. I don’t believe in limiting my options, so despite having the greatest respect for vegetarians and vegans, I’ve never been tempted to become one (I have a lot of respect for religion, too, but that’s another story). 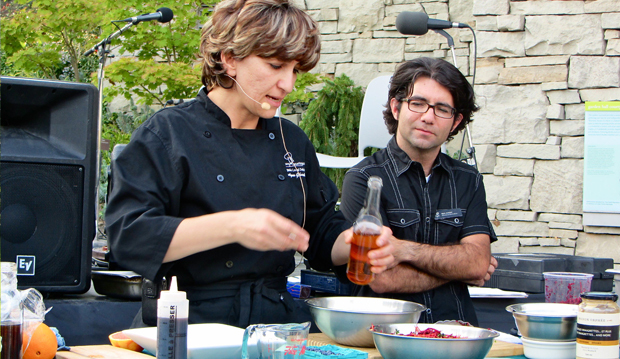 However, watching Chef Evelyne Gharibian of Hearty Catering, transform raw veggies from our Organic Farmers’ Market into the beautiful dish seen above at the last Chef’s Demonstration of the season, made me rethink my priorities. The crowd in the audience seemed to approve. 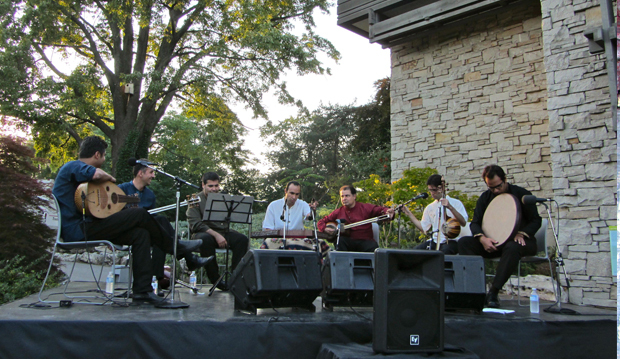 Oh wait, perhaps that was a standing ovation for the Sarv Ensemble, who, using traditional instruments such as the dar, tombek and setar, took us for a magical mystery tour of the classical and folk music of Iran for our last Edwards Summer Music Series: Gardens of Song of the season. 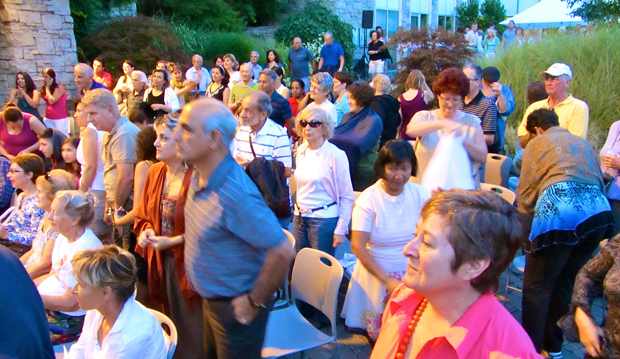 Our deepest thanks go to the Edwards Charitable Foundation for so generously supporting another summer’s-worth of free concerts from across the musical spectrum. Thanks, too, to programmer Jim Shedden, our co-hosts Murray Foster and Errol Nazareth, and sound-and-staging wizards Westbury. A few days ago, I fired off this postcard-pretty shot of the front of our building through some of the new plantings in the parking lot. The sedum, grasses and coneflowers have all taken very well, and seem very much at home. I love coming in to work each morning as there’s always something in our gardens to admire. 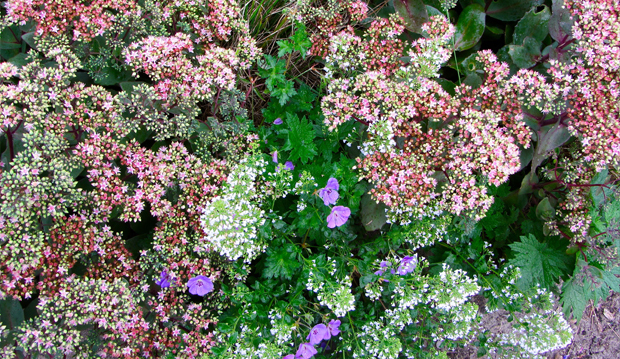 Right now, some of the late summer beauties are coming into their own, such as sedum, seen here with calamint and Geranium ‘Rozeanne’, which are still going strong. 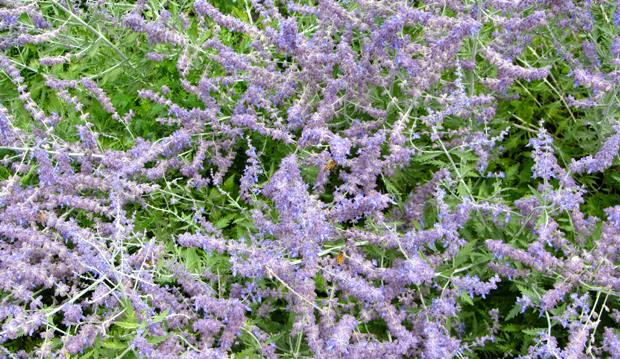 While the Russian sage (Perovskia atriplicifolia), a garden workhorse if there ever was one, has been blooming for weeks and weeks, and continues to provide food for bees. 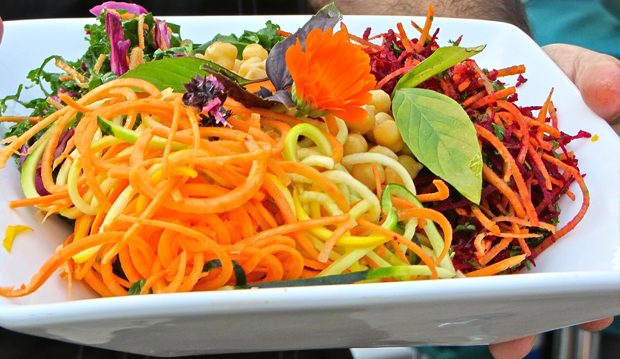 Of course, it’s not just about the plants and flowers at the TBG–we’re growing budding chefs, too. 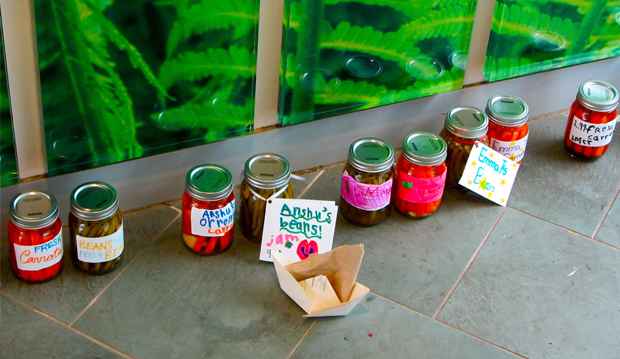 Children had a great time learning how to preserve the veggies they’d picked themselves from our Teaching Garden and Kitchen Garden at Cooking Camp, the last summer camp of the season. The camps, chefs’ demos and concerts may be finished for this year, but our Organic Farmers’ Market lives on every Thursday through October 4 from 3 to 7 p.m. 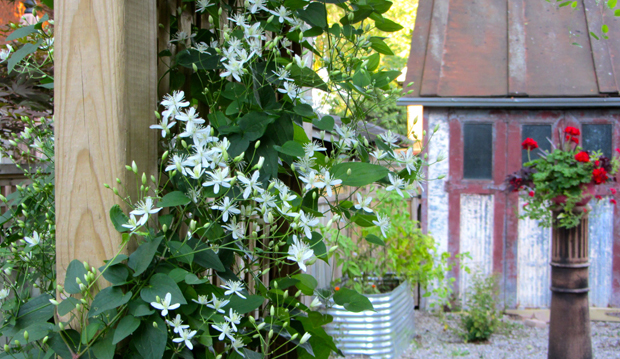 This sweet autumn clematis, a.k.a. Virgin’s Bower (Clematis terniflora) was planted around my arbour last summer and has come into bloom. It’s definitely a story of “triumph over adversity,” as I discovered that beneath my gravel driveway is an old asphalt driveway, so my dream of digging out planting holes through the gravel has hit a roadblock. Literally. Still, a strong and very patient contractor did manage to excavate two smallish holes, which we then lined with landscape cloth and filled with triple mix. As you can imagine, gravel + limestone screenings+ asphalt+ sour, compacted soil = an inhospitable environment for plants, but my two clematis have come through and are thriving. Am I a Bad Person for wanting to get rid of a couple of old established plants in my garden? 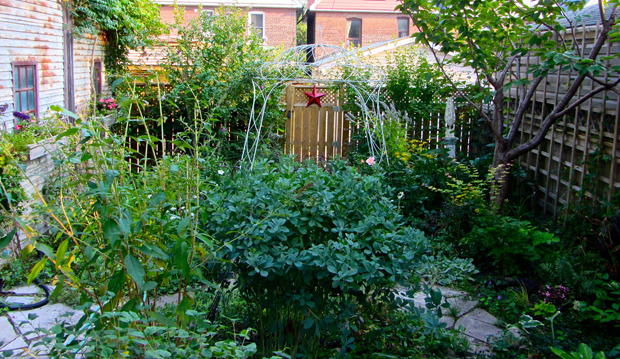 The problem is, if you’re on my deck, the ancient, gnarled, not-terribly-prolific budleja on the left completely cuts off the view of the rest of the wide-but-shallow garden. 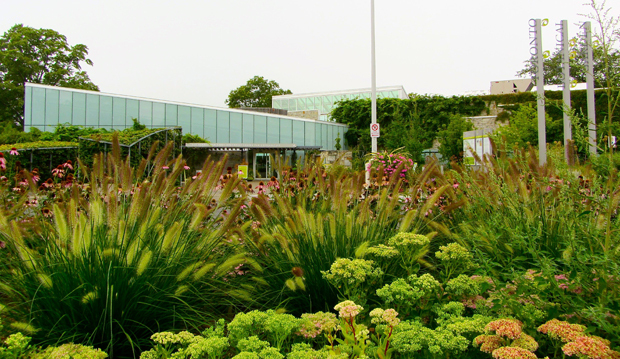 It’s aided and abetted by the massively tall clump of Baptisia australis on the right, which further obstructs the view, and is a living example of “wrong plant, wrong place.” Farther back on the right is an ailing, misshapen Prunus with two large holes in its trunk. Derek Welsh of Authentic Tree Care has been trying to gently prune it back to some sort of shape and health, but it may be a losing battle, as its branches keep dying off and it is simply…let’s face it…uggers. This is a good time of year to take stock, and parts of my garden need some serious rethinking (Baptisia hates to be moved, though, so if I don’t want to lose it, the best I can do is to keep it pruned back after flowering, which means I’ll lose its seedpods). Sigh. 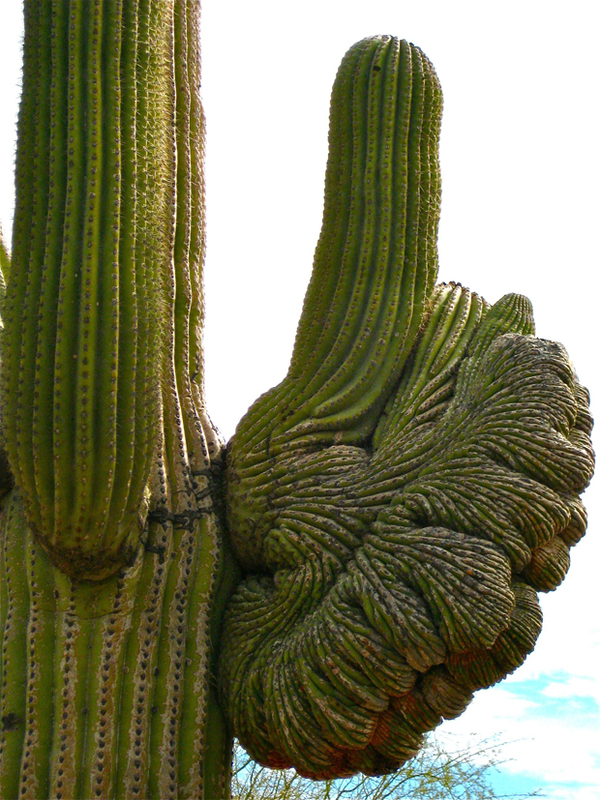 I like to give all plants a fighting chance, but it may be time to toughen my stance. 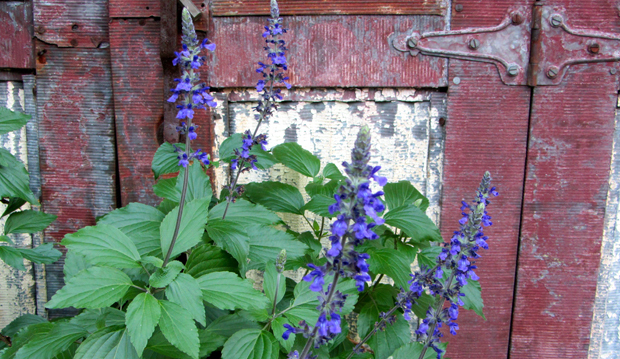 While lots of other annuals are starting to pooch out, the ‘Victoria Blue’ salvia is really coming into its own, just when we need it the most. Hooray! The teenaged boy raccoons have moved out of the ceiling of my garage. 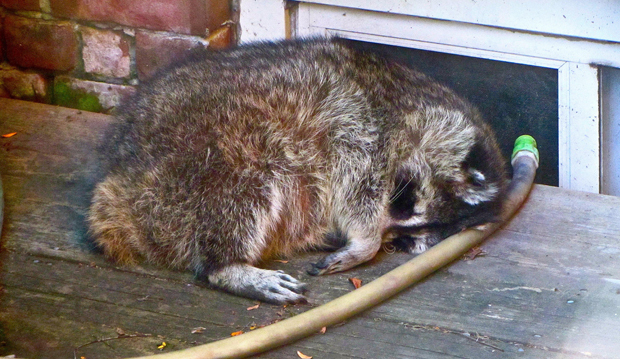 However, I caught this one sleeping on my back deck in the mid-afternoon. When he heard me coming, he opened one eye, grunted and turned over—he reminded me a bit of my ex-husband. I left him to it. Sometimes the best view of Toronto is in the rearview mirror as you drive north. 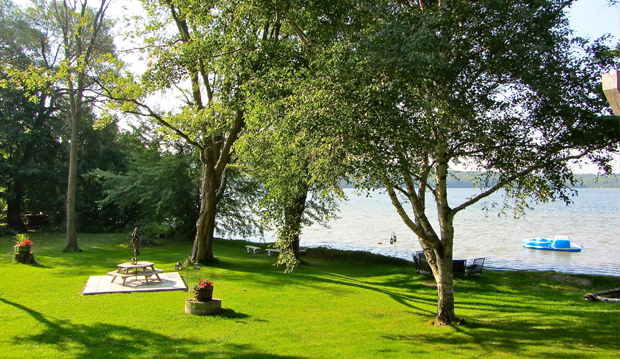 My friend Marion has a lovely home right on the shores of Bass Lake in Orillia, and invited me to visit. This is a view of her “backyard.” It was grand to get out of the smoggy city and into the fresh air. 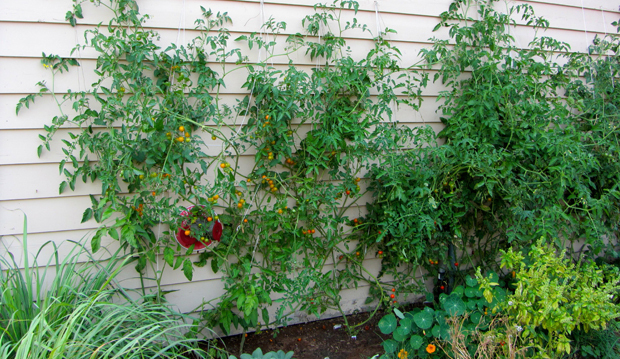 Heading into a local inn for dinner in Orillia, I noticed how these cherry tomatoes were being treated as though they were morning glories. No stakes, just some stout twine woven through to keep them upright and flush against the wall of the building. Smart. There are few things I enjoy more than a nice trip. 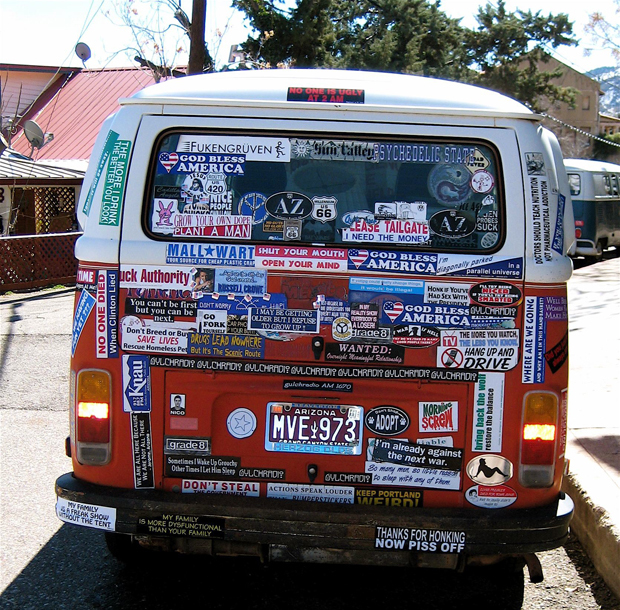 I took this photo in Arizona a couple of years ago, in a delightful, hippie-ish town called Jerome. But next week, courtesy of Tourism Ireland, I’ll be jetting off for a grand week of touring gardens and other beauty spots in order to photograph and write about them. (The things I’m willing to do for you, my cherubs!) Anyway, once I’m back, I’ll regale you here with my adventures, discoveries and tips. So it’s thumbs-up for travelling, and it’s thumbs-up for you, gentle reader. Lanate: Clothed with woolly and intergrown hairs. * From Latin lana = wool. Check out the young Salvia argentea plants growing in the garden! *Jackson, B….